There are currently no GMO oranges available on the market. So why does Tropicana insist on using a Non-GMO Project verified label on its original orange juice products that have literally one ingredient – oranges? Tropicana’s sales declined nearly 25 percent over a five year time span from 2009 to 2014. The addition of this unnecessary food label in 2016 is likely just a ploy to squeeze out more sales. 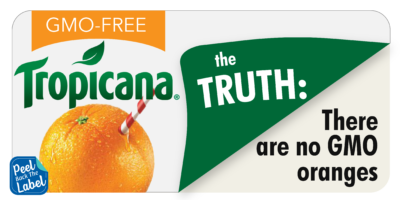 Instead of using truth and transparency in food labeling, Tropicana is joining the ranks of deceptive marketing gurus. C’mon man, adding a GMO-free label on a product with no GM-alternative is just pulp fiction. Tropicana is shamelessly injecting unnecessary fear and confusion in customers. Consumers deserve better than this. Tell Tropicana you prefer truth and transparency over misleading labels by contacting them today on Facebook, Twitter and over email.